Iwamoto, K., Ikawa, T.: 2000: A novel glycolate oxidase requiring flavin mononucleotide as the cofactor in the prasinophycean alga Mesostigma viride. : Plant Cell Physiol., 41, 988-991. Lemieux, C., Otis, C., Turmel, M.: 2000: Ancestral chloroplast in Mesostigma viride reveals an early branch of green plant evolution. : Nature, 403, 649-652. 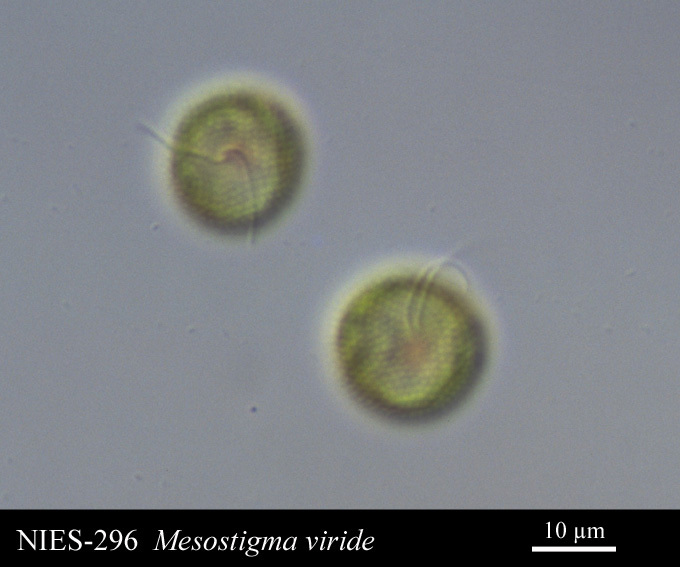 Turmel, M., Otis, C., Lemieux, C.: 2002b: The complete mitochondrial DNA sequence of Mesostigma viride identifies this green alga as the earliest green plant divergence and predicts a highly compact mitochondrial genome in the ancestor of all green plants. : Mol. Biol. Evol., 19, 24-38. Turmel, M., Ehara, M., Otis, C., Lemieux, C.: 2002a: Phylogenetic relationships among streptophytes as inferred from chloroplast small and large subunit rRNA gene sequences. : J. Phycol., 38, 364-375. Yoshii, Y., Takaichi, S., Maoka, T., Inouye, I.: 2003: Photosynthetic pigment composition in the primitive green alga Mesostigma viride (Prasinophyceae): phylogenetic and evolutionary implications. : J. Phycol., 39, 570-576. Nedelcu, A. M., Borza, T., Lee, R. W.: 2006: A land-plant specific multigene family in the unicellular Mesostigma argues for its close relationship to Streptophyta. : Mol. Biol. Evol., 23, 1011-1015. Hua, JM., Smith, D. R., Borza, T., Lee, R. W.: 2012: Similar relative mutation rates in the three genetic compartments of Mesostigma and Chlamydomonas. : Protist, 163, 105-115. Laflamme, M., Lee, R. W.: 2003: Mitochondrial genome conformation among CW-group Chlorophycean algae. : J. Phycol., 39, 213-220. Miyagishima, S., Suzuki, K., Okazaki, K., Kabeya, Y.: 2012: Expression of the nucleus-encoded chloroplast division genes and proteins regulated by the algal cell cycle. : Mol. Biol. Evol., 29, 2957-2970. Schwender, J., Gemünden, C., Lichtenthaler, H. K.: 2001: Chlorophyta exclusively use the 1-deoxyxylulose 5-phosphate/2-C-methylerythritol 4-phosphate pathway for the biosynthesis of isoprenoids. : Planta, 212, 416-423. Hua, J., Lee, R.W. : 2012: Factors affecting codon bias in the mitochondrial genomes of the Streptophyte Mesostigma viride and the Chlorophyte Chlamydomonas reinhardtii. : J. Eucaryot. Microbiol., 59, 287-289.